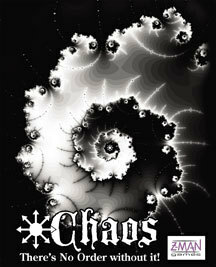 Chaos- I'd read the rules to this card game previously and dismissed it as soon as I saw the "pass your hands around in a circle" rule. I think I was wrong. This little brain-bender plays like Go Fish on crack. One hand we played was over on the first turn, another went on for fifteen minutes. The game was weird, very weird but quite interesting and surprisingly tactical. There's no use in explaining it, one just needs to play it. And for 7 bucks, it's definitely worth a try. 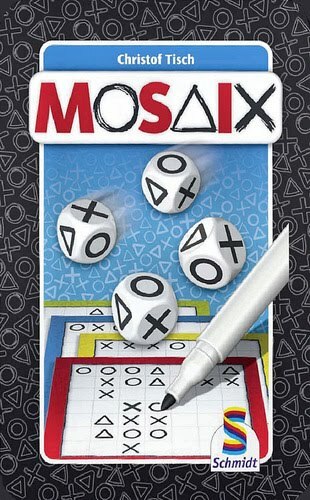 Mosaix- Another surprise. I'd heard good things about this Take It Easy-like game of boxes. You roll four dice with three symbols and arrange the dice in a Tetris shape. Then everyone adds those to their board. Each group of five or more on the board scores for you but you want a lot of groups for more points. Very tricky little game. Starts off easy then as the board fills you have to consider the possible points you're giving away to your opponents when you arrange the dice. Headache-inducing but quite fun. psst... LOVE, LOVE, LOVE playing Fits, by the way! No, Magda, nothing like that. It's very unlike any card game I've played. I need to play it again before I can really describe it to you. For 7 bucks, I'd say just go and pick it up and try it.